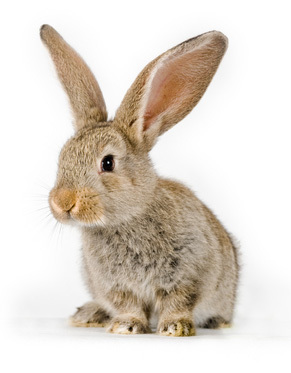 Rabbits do not have heat cycles and may not show any signs of being old enough to breed. They reach sexual maturity between 4 to 8 months of age. The larger the rabbit the longer it usually takes to reach maturity. Rabbits that don’t begin to breed at a young age will usually not breed. You may often not be able to tell when a female is ready, but some may show signs of being receptive to the male by rubbing their chins against the cage. The female should be taken to the males cage. There, the male will chase the female for a few minutes before mating with her. After mating you should return the female to her own cage. The gestation period is between 28 to 32 days. A nest-birthing box should be provided for the pregnant female at around 26 days of gestation. Birth usually occurs in the early morning hours. Do not disturb your pet while she is giving birth to prevent excitement and stress which may cause her to harm the babies. The average litter is 7-8 babies but can be much larger. Bunnies are born hairless, blind and deaf. They will open their eyes at around 10 days old. After their eyes are open they will begin to eat solid food. The mother will wean them when they are around 4-6 weeks old. The babies should be kept together for an addition 1-2 weeks after weaning and then may be separated. Sexing your pet rabbit is easy. Hold your pet on its back. The female has a V shaped opening with a slit in the center. The male will have a small round area of raised skin with a small hole in the center.